Pedestrians in downtown Appleton need look no further than the sidewalk to find examples of compassion these days. A dozen, newly cast, custom-made manhole covers that feature designs depicting some aspect of compassion are adding a bit of humanity to the otherwise lifeless sidewalks running up and down College Ave. The project is the latest brainchild of public art specialist Rob Neilson, the Frederick R. Layton Professor of Art at Lawrence University, who challenged students in his sculpture class this spring to come up with their own personal definition of compassion. The manhole cover assignment was inspired by the community-wide Compassion Project, in which 10,000 Appleton school children used 6-by-6-inch ceramic tiles to create drawings and paintings of what compassion means to them. Using manhole covers as a medium was a welcomed return to Neilson’s Detroit roots and his foundry background. His father worked for Kasle Steel and he spent a good part of his youth rummaging through scrap yards in search of discarded metals he could repurpose into art. “This project was great fun and something I’ve wanted to do for a long time,” said Neilson, who contributed one of the 12 new manholes. Titled “Mandela Mandala,” Neilson’s creation features eight images of former South Africa President Nelson Mandela arranged into a design bordering on the abstract. Student covers include a thumbprint, representing an individual responsibility to show compassion; a hand grasping a human liver that honors a friend who underwent an organ transplant and a series of intersecting ripples of water to illustrate the far-reaching effects of each person’s actions. After creating their designs, Neilson and his students visited the company synonymous with manhole covers — Neenah Foundry — which made molds of each design and created new cast iron covers. The covers will be installed by crews from the city of Appleton. 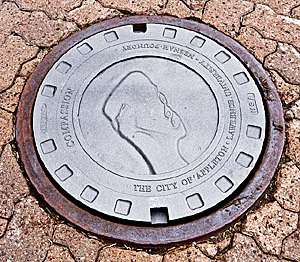 The manhole cover designs, which are essentially relief sculptures, were chosen for installation in the sidewalk rather than the street, so that people would be able to stop, view and admire them. In addition to the set of 12 manhole covers for the sidewalks, two complete extra sets of covers were made for Lawrence and the Trout Museum of Art by Neenah Foundry, which underwrote the cost of the project.